After seven long months of writing, reading, coding, and learning, learning, learning, I finally have something to show for it. Jonathan Chaffer and I just had our first book published. When we started back in December, the goal was to write a single book of roughly 250 pages. Somewhere along the way, however, we got a little carried away and ended up writing so much that the publisher decided to split it into two books—a 380-page tutorial and an approximately 300-page reference. The publisher even let me take a picture for the cover. If you don’t know anything about jQuery (and even if you do), you might wonder why I would squander the opportunity for a cover photo on a stack of dumbbell weights in the sand. Well, the weights mirror the shape of the jQuery logo, which is derived from the Devo energy dome. Also, in the book we refer to jQuery “doing the heavy lifting” for certain programming tasks. I took a few shots of the weights in my house, too, but the publisher liked the ones at the Lake Michigan beach better. This photo was taken in Holland, Michigan, right down the steps from my parents-in-law’s cottage. This entry was posted in technology. Bookmark the permalink. Follow any comments here with the RSS feed for this post. Rock on, Swedish mountain! We’re super proud of you! Don’t think for a minute we won’t make you sign our copy! Congrats on all you hard work! Silly me! I haven’t been checking English rules for a while and look what happened! Good for you! How exciting to get a photo credit too! There’s your name right on the front! I know this has been a long haul, but how satisfying! I read the description on Amazon and my eyes started to glaze over- I don’t know how you understand all that. A huge congratulations, Karl! A published author. Now that has a nice ring to it! Congrats Karl! We are very proud of you! Of course, the whole topic is Greek to me, but I love the photo on the cover and the symbolism behind it. We are looking forward to more great things from you! I just tried to buy a copy of your book, and was told that the first printing is sold out!! Wow, you must be thrilled. Way to go, Karl! I’m looking forward to getting my copy of each book. I love the cover, too…maybe you should call the next book “Whip It” and keep it all in the Devo family. Thanks, everyone, for your congratulatory notes. It’s great to have such supportive friends and family. Dad, where did you try to buy the book? I looked at amazon.com and packtpub.com, and they both appeared to have it in stock. I even put the book in my “shopping cart” at amazon, and it seemed to work just fine. Hmmm….. in retrospect, maybe that wasn’t such a good joke, after all. Well, you totally fooled me. Wow, I’m so gullible! Seriously, everyone, I can testify to the fact that Packt still has a few copies left. Buy now, so as not to be left out! So proud of you, Karl! oh karl, this is so exciting, you smarty-pants, you…..i fancy that i will buy your book and learn something new and exciting, but fear that what would really happen is i would just stare a lot at the cool cover. i like the creativity in designing your cover photograph. hmmmmm…..tech smart AND artsy, too. you really do have it all! my warmest congratulations on this accomplishment. It’s you and Ms. Rowling competing for the top spot on the NYT list this week! I know how hers ends so I’ll spend the weekend reading your instead. Really….Congratulations. You should be so very proud of yourself. It wasn’t an easy thing that you just accomplished and we are happy to share the thrill with you. Way to go Karl !!! Congratulations. Sara is right you know… what will be next? I am going to test my IT staff with your book to see if they can hold a candle to you!!! Wow, way to put West Michigan on the map. As a Devo fan and Grand Rapids based web designer/developer – I salute you! Congrats on the book! Big congrats! Hope the rest of this summer is stress free! Congrats, Karl! 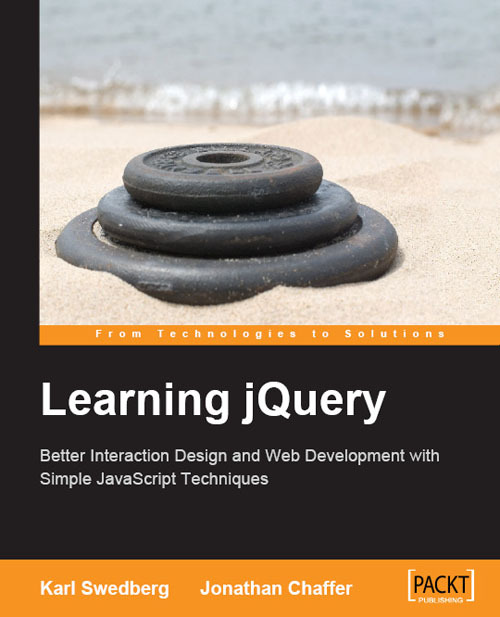 I would totally read the book if I thought I had a use for jQuery. I can’t wait to see what your next project will be. Have a great summer; we’ll be back in Grand Rapids sometime in the near future, I promise. Heyo. The book is great stuff. It was great to see you this weekend. We’ll have to catch up again sometime soon. You’re all making me blush. Thanks again for all the support. Camille, did you really read Harry Potter before you were allowed to sell it? Ryan, thanks for stopping by! Wow, your site is impressive; looks you’ve been doing some cartography of your own. We should meet up some time for lunch, since we apparently work three blocks from each other. Kevin, looking forward to seeing you when you’re back in town. AJ, it was great to see you, too. Let’s definitely get together again soon. I’m sure we’ll have plenty of geeky stuff we can talk about.